When the days concede to night in the winter, there is a certain comfort in the glow of neon city lights. 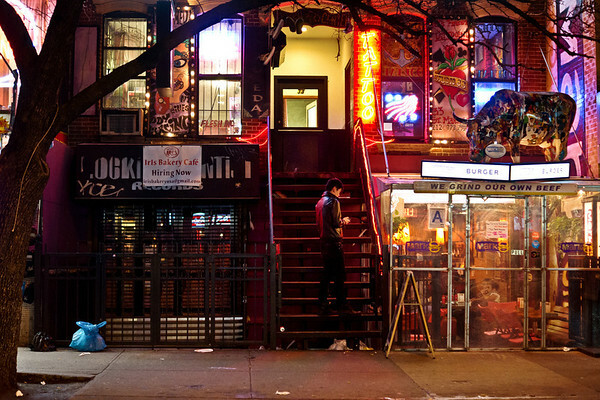 This particular view is of St. Mark's Place in the East Village. The cow belongs to the restaurant Mark and the neon belongs to Andromeda Tattoo and Piercing. The sign that is partially concealed is Rockit Scientist Records which was a great records store that dated back to the mid 1990s when the East Village was home to far more records stores and had a more eclectic vibe. There is a coldness to neon that is eclipsed by a peculiar sort of warmth when the windchills dip into the single digits. It's a sign of life. People tend to huddle under the glow of the lights in the winter with a frequency that isn't seen as much in warmer months as if they are city moths drawn to the glowing promise of warmth.